Cuban is a country with a fascinating history that can be remembered through Cuban gold coins for sale a William Youngman Inc. The limited access, the rest of the world has had to this nation, makes some of its older currency extremely rare. Interestingly enough, Cuba is one of the few nations that has 2 different currencies circulating. The Cuban peso is the older and more collectible currency, but the Cuban Convertible Pesos are also used. Let’s dive deeper into the history of some rare Cuban gold coins and silver coins. In 1897, Cuba was fighting a war against Spain for its freedom. The small country struggled to fund the war efforts, so they issued souvenir coins to the United States as an effort to raise funds. When Cuba gained its independence and the republic was founded, this coin was accepted as currency because of what it represented. Under 10,000 of this coins were created and today they can be worth hundreds of dollars in the right condition. The coin has a bust of Lady Liberty modeled by Leonor Molina on one side and the Cuban Coat of Arms on the other side. This silver coin is a must have for any Cuban numismatic. Identical to the 1897 Cuban coin, the 1898 version was also created to raise funds for the continuing war against Spain. The coin has the same face of Leonor Molin and Cuban Coat of Arms pressed into it. However, this coin is not treated as a souvenir coin or medallion. Still, one of these coins in mint condition could be worth almost $2,000 dollars. 1915 was an important year for Cuban numismatics because it was the year that Cuban started minting coins. Available in both gold and silver, there are 1915 pesos in existence of multiple different face values. Because these coins are over 100 years old, it is difficult to find them in top condition. Although silver versions of this coin can be found for under $200 depending on the condition, the gold versions are much rarer and much more valuable. 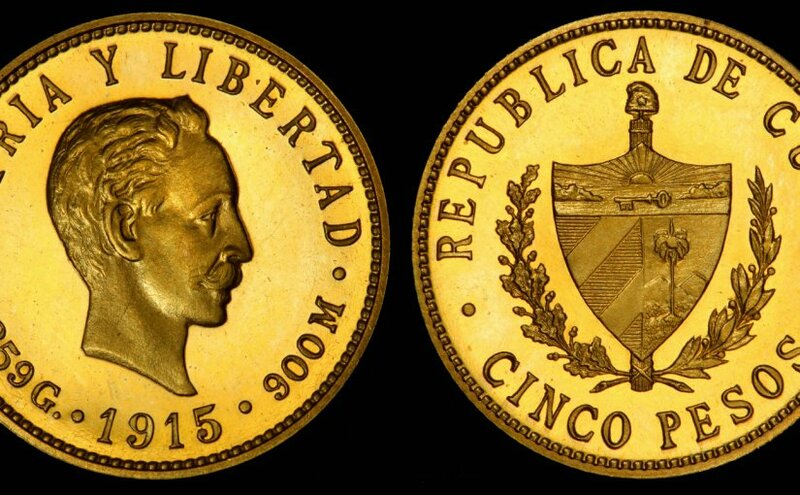 A 1915 Cuban 1 pesos gold coin can be worth several hundred to thousands of dollars. The 1983 Cuban 1 peso has a spiny lobster depicted on one side and the Cuban Coat of Arms on the other. This coin was issued for the World Fisheries Conference along with many other countries. This peso is uncirculated and there were only 5,000 pieces minted. This coin is not just a great find for Cuban coin collections, but also for collections featuring animals or sea creatures. Some Cuban coins are particularly rare in America due to laws making it illegal to import them into the states. The 1984 Castle Morro 1 peso coin is a perfect example of this. The coin is low mintage, uncirculated, and currently illegal to import to America. The coin is a treasure for Cuban numismatists or people with castle themed collections. Hopefully, with communications opening between the US and Cuba, these 3-decade old coins will soon be allowed in the states. In 1995, Cuba minted 100 sets of Pattern Crowns of 10 Pesos. These sets were to commemorate the centenary of Jose Marti’s birth. Marti was an active figure in the war for Cuba’s freedom and an important part of the country’s history. These coins are struck in a variety of metals including sterling Silver, cupronickel, aluminum, brass, gold plated alloy, copper, and tri-metallic. Being that there were only 100 of these sets created, they are highly collectible and a prize for a passionate Cuban numismatist. Cuba is a small country in the Caribbean with a unique history. From rare gold coins like a 1915 Peso to pattern sets like the 1995 10 pesos, there is a lot to collect. Most of the collectible Cuban coins are the ones created prior to 1959, but there are noteworthy coins made following that year. Rare Cuban coins for sale are not just for collectors, they would also make a great present for someone who lived or is passionate about Cuba’s past.